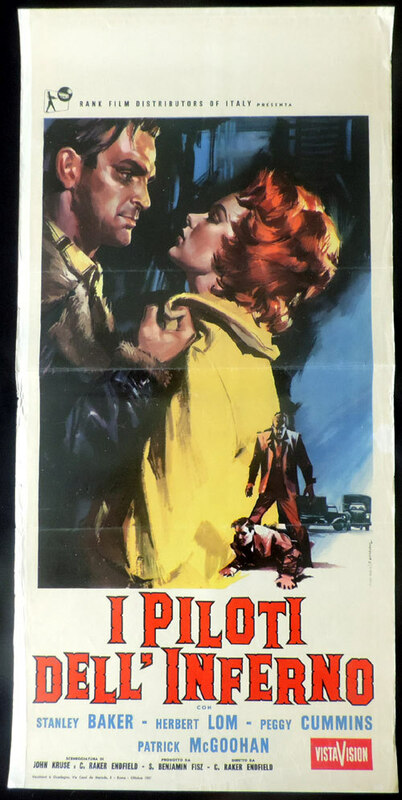 Just in, a wonderful Italian Locandina Movie Poster for the cult British film Hell Drivers, a dark and sometimes disturbing insight into the life of truck drivers in the north of England. Cy Endfield directs a fine cast with Stanley Baker as the ex con who picks up a job driving for an unscrupulous trucking company. Patrick McGoohan is brilliant as the gun driver who ruthlessly breaks all the rules and lets no one stand in his way - whatever the cost. The poster is an example of the superb art of Alessandro Biffignandi renowned for his artwork of comic covers.